Garmin Edge 800 has a 2.6-inch touchscreen which is glove friendly. Mapping includes a basemap which includes major roads and cities. This bike device is ideal for training, touring, commuting, competitive cycling and mountain biking. There are three models available: these the basic Edge 800 with base map, a perfomance bundle which includes heart rate monitor and speed/cadence sensor and navigation bundle that includes European City Navigator mapping and heart rate monitor and speed/cadence sensor. Accessories, spares and parts are still available for your Edge 800, as are various on-road and off-road maps. The Garmin Edge 800 has a 2.6-inch touchscreen which is bright sunlight readable. The screen is glove friendly and you can pan and zoom with a quick tap of the touchscreen. The Edge 800 features built-in basemap with major road and major cities and it can be updated with a selection of GB Discoverer maps to include contours, elevations, summits, paths and routable roads. Prompts are given on screen for directions to your destination. All this makes the Edge 800 perfect for training, touring, commuting, competitive cycling and mountain biking. The Edge 800 is waterproof to IPX 7 standards. It also features automatic time zone adjustment ideal for use on European holidays. You can use the Edge 800 to race and beat previous goals to better your time and you can plan your workouts too. Alternatively, you may like to use Garmin Connect which allows you to get millions of rides from other users downloaded to your Edge 800 device. Furthermore BaseCamp software allows you to create you own routes on a computer and then transfer them to your Edge 800 where you can view them in 2D, 3D or view elevation(s). After your ride you can use Edge 800 to see the route you have ridden on a map, a summary of your ride and create further goals. You also can use Garmin Connect to share your rides with other Garmin users using a PC or a Mac. All three models of the Garmin Edge 800 come preloaded with a basemap. In addition the Edge 800 Performance and Navigation Bundle also includes City Navigator NT European maps on SD/microSD Card - making this option ideal if you intend to use the Edge 800 for road cycling right across the UK, Eastern and Western Europe. If you intend to cycle on roads in just the UK or Ireland, then you may like to consider buying a different model and then add UK and Ireland City Navigator NT street-level road maps. If on the other hand you'd like to take the Edge 800 and your cycling off road for e.g. mountain biking, then you'd be better off considering adding either Garmin Edge 800 TOPO or GB Discoverer maps. TOPO maps provides land contours and elevation for Great Britain at a scale varyng between 1:50k to 1:100K. GB Discoverer maps provide full Ordnance Survey Landranger maps with the same detail as the paper version and at a scale of 1:50k or 1:25k. Looking for accessories and spares for the Garmin Edge 800? View the full range here. All parts are genuine Garmin product and specifically designed for use with the Garmin cycle GPS 800 device. 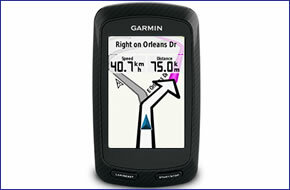 Discover the optional range of maps that you can add to the Garmin Edge 800 here. Maps available include GB Discoverer Ordnance Survey (OS) mapping and TOPO topographical mapping.